Dr. Curtis Harris, associate professor of surgery at the University of South Alabama College of Medicine, says over-exposure to the sun's ultraviolet (UV) light is the most common cause of skin cancer. Skin cancer, the abnormal growth of skin cells, is the most diagnosed of all cancers. Although the sun does many beneficial things for our bodies, Dr. Harris says it is important to limit your exposure to sunlight. According to Dr. Harris, who is a plastic surgeon with USA Physicians Group, it is beneficial to avoid the sun between the hours of 10 a.m. and 3 p.m. when ultraviolet rays are most intense. People who have a light skin tone and freckles are more susceptible, because they have less skin pigment to protect them. Dr. Harris says early detection of skin cancer gives you the greatest chance for successful skin cancer treatment. “If you have exposed your skin to the sun from ages 6-18 on a regular basis, 20 years down the road you are more likely to develop sun exposure problems,” he adds. He recommends that you routinely see a doctor to examine questionable areas on your skin. If cancer is found, treatment may include radiation or removal. 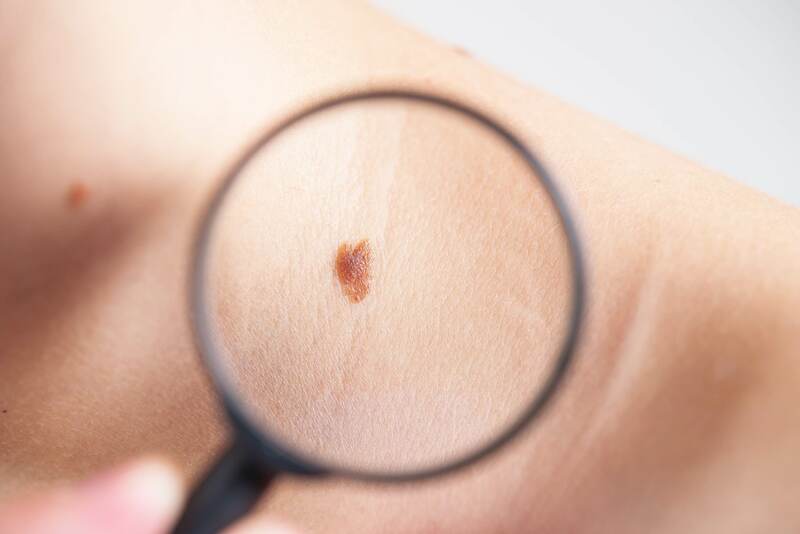 According to Dr. Harris, it is important to know the signs of skin cancer and to take action if there are suspicious moles, spots or sore spots that won't heal. Normal moles or freckles are completely symmetrical. If you draw a line through a normal spot, you would have two symmetrical halves. In cases of skin cancer, spots do not look the same on both sides. A mole or spot with blurry and/or jagged edges. A mole that is more than one hue is suspicious and needs to be evaluated by a doctor. You should be concerned about regions that change from dark brown to black. However, melanoma—the most deadly form of skin cancer—can be pink or multi-colored. If a spot is larger than a pencil eraser (about 1/4 inch or 6 mm), it needs to be examined by a doctor. This includes areas that do not have any other abnormalities such as color, border or asymmetry. Elevation means the mole is raised above the surface and has an uneven surface. Remember that you are exposed to the sun when you are driving, crossing the street or even checking the mail. You should use a sunscreen with an SPF of at least 30 any time you are exposed to the sun, and it should be applied every few hours. Also, try to avoid tanning oils and products to accelerate tans, which can increase exposure. Skin cancer and melanoma can occur at any age but are most commonly seen in patients between the ages of 50 and 70. Visit a doctor for a skin check at least one a year. If there are changes in an area of the skin, it is easier to treat with early detection.